There's no getting around the fact that croissants aren't good for you. They are full of refined white flour and fat. Sure, some people might eat them every day, and I envy those people more than they will ever know. But for most of us, croissants are a sometimes treat. As such, when you have one, it should be special. And to qualify as such they have to deliver on three fronts: taste, texture and appearance. What does a good croissant look like? Well for starters, it's small. Plus, the outside is well burnished and hints at the multitude of light and fluffy layers that are inside. Despite being small, a good croissant will have some height to it, given how much air is contained within. 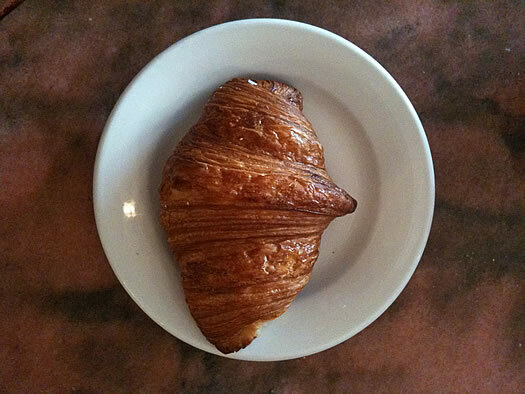 Biting into a croissant should send shards of the exterior crust flying. Even though a croissant is baked, the edges of a well-made one suggest that perhaps it was fried in butter -- they are beyond crisp; they crackle. The interior should both easily coalesce under your bite, but then spring right back up into its original shape. And the taste is all butter. Mrs. London delivers the goods. And all of that pleasure comes at the paltry sum of $2.75. For anyone who has ever tried to make one of these from scratch, the value of such an exchange is self-evident. Making good croissants is hard. It takes a lot of butter, time, and skill to make them well. And this is a pittance to pay for something so delicious. Plus you get to enjoy them in a precious setting, at a table and on a proper plate. Mrs. London's also makes a very special hot chocolate, which is the natural accompaniment to a classic croissant. Yes, it's totally decadent. But that is exactly the point. 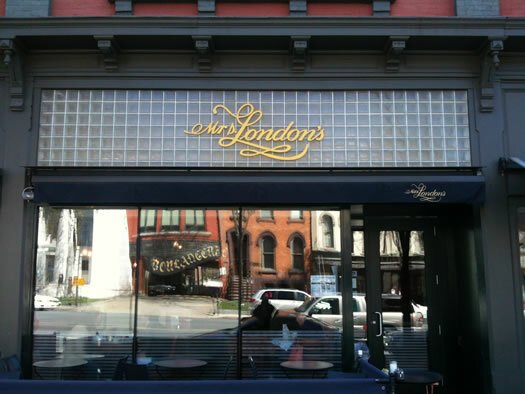 I love Mrs. London's -- and the rest of their offerings are just as good. Last time I went, I had an apple tart that was flaky and sweet and just perfect. The time before, I had a scone that was probably the best scone I've ever had. And their sandwiches make a great lunch (or really late breakfast, as is usually the case for me). $3 is too much for a croissant? I'll echo Daniel B himself by saying "this is why we can't have nice things." @jen They can charge those prices because there is no one (and I do mean no one) in the capital region that makes better bread and pastries. There is simply no competition. In the city, I can go into almost any given neighborhood and find bakeries that are churning out fabulous product on the regular. Not so in upstate NY. > What does a good croissant look like? Well for starters, it's small. It should be mentioned that they have a table at the Troy Farmers' Market. @ethan - Credit for that line goes to B who said it during the discussion of Carmine's new Brazilian place. For the record, I actually don't agree. Nice things need not be expensive. And yes, the breads and some of the other items at Mrs. London's are quite pricey. But $2.75 for one of these magnificent croissants is a bargain, especially when one considers that people will fork over more than $3 for a cupcake! I have no idea how much a venti-low-fat-blueberry-latte-no-whip costs. But I'm guessing substantially more than this hand crafted piece of fine pastry. Some things are worth their cost, for the labor, ingredients, skill, and specialized equipment that goes into their production. These croissants qualify. Yes, you can get cheaper croissants that are just fine. But I would be amazed if anyone could name a bakery in this country that made a better croissant than this for significantly less money. Regarding size, pastry has crept up in size much like bagels have. Most of the croissants sold today are these gargantuan creatures. Small does not mean minuscule. Most Saturday mornings I have somewhere between half and a whole one of these croissants at the Troy Farmers' Market. I really haven't found a better croissant in this area. I've looked. This is actually a meme. I'm not sure about justifying an overpriced item by pointing at another overpriced item. Let me get back to you on that. In this country? Daniel, why stop there, and not include the continent, nay, the world. Are you sure the croissants at Miss London aren't spiked with dehydrated kool-aid? > that made a better croissant than this for significantly less money. 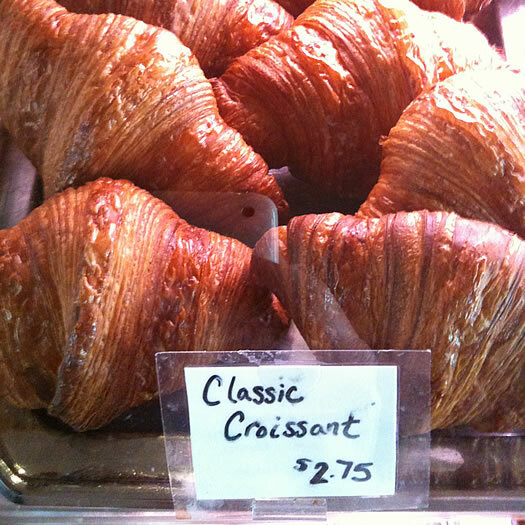 The croissants at Crisan on Lark are great, bigger, for $1.75. They are the best in the Milky Way and I'm backing that up with one thing that is common to Daniel's own argument and croissants: lots of hot air. PS: the reason why you might not want small croissants (and why they are bigger in that obnoxious country across the Atlantic ocean that shall not be named), is because the thinner they are, the less you get to experience the change of texture through the fluffy layers, from the crackling crust that comes from the egg wash down to the much tender/doughy/buttery interior (did I just write that?). Since a croissant has tapered ends, the smaller they are the greater the chance you end up with burnt or boring extremities (cue extremity joke). Makes sense, but hey, I'm not a foodie, I just have a sweet problem. A few years back Food and Wine magazine declared Mrs. London's the best bakery in North America. Nothing has changed. I adore their almond croissants. I get one for lunch almost every Saturday at the Troy farmers' market. Most things at Mrs. London's are great, including the croissants. And to my knowledge, Mrs. L's is the only place to get great bread in the Capital Region (good bread can be had from All Good Bakers). But the croissants at Crisan are superb, and cheaper, and closer. One might even say that something that is excellent, relatively inexpensive, and close to home, could be called the "best". For oneself. And one's dead horse, that one is viciously beating. -S, Y U NO let me take credit for meme? U mad? I love Crisan. Their croissants are much improved from when the bakery opened, but the exterior is still a little sandy and doesn't quite shatter. 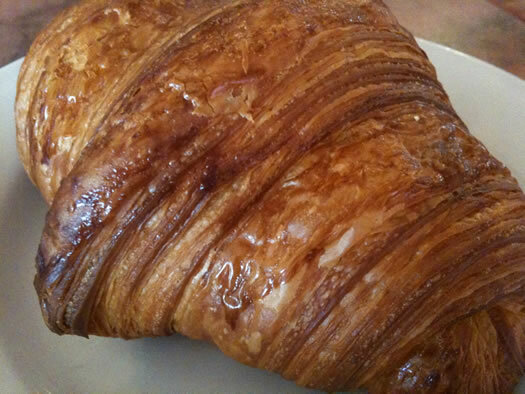 Still, they are among the few croissants that are totally worth the fat and calorie hit. We are very lucky to have such rivalries in the region. I stand behind the assertion that the Mrs. London's version is superior (if only marginally). With gas at $4 per gallon it may not be worth a drive for the croissants alone. But if you've only had the Crisan version, it's worthwhile to give these a go next time you find yourself in Saratoga Springs. What's closer depends upon where one lives. I lived in Albany for most of my life. The last seven, nearly eight years in downtown Saratoga. Mrs. London's is one of the many reasons I'm happy here. If we had remained in Albany I would undoubtably be happy as well. What this means to me is that this region has a lot to offer especially for those of us that appreciate an urban lifestyle. Their almond croissants are extraordinary. They are $3.75 each, and worth every penny. >They are full of refined white flour and fat. Refined as in not high protein flour, yes. But croissants can still be made from wonderful unbleached organic flour so you can feel virtuous while clogging your arteries. Also, great photos. You have a new camera? Tell us about it! Excellent column, Ce ce bon Croissant!